Woody and his family. 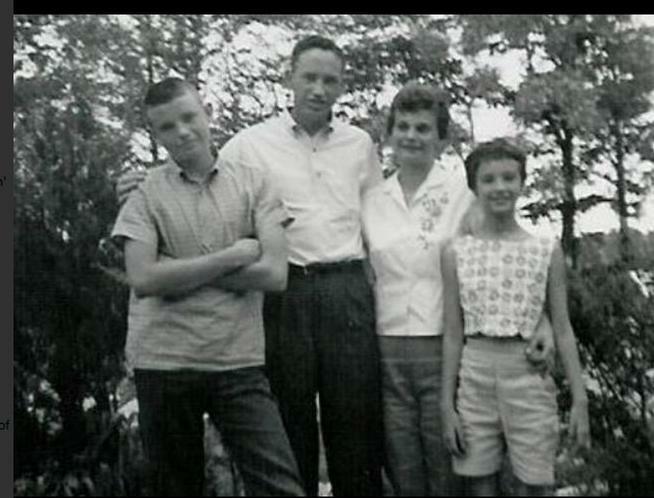 Woody on the left, his father, and mother and sister. Photo provided by Woody Paige. Mom always has watched over me. She wasn’t feeling so good again a couple of weeks ago. So we went to the hospital for the 17th time in the past three years. (She kept count in her journal.) Billie Paige has been battling cancer like Troy Tulowitzki battling Clayton Kershaw’s curveball, and she had fouled off 16 nasty pitches. I use the comparison only because she loved baseball, especially Tulo and the Rockies. I took her to her first major-league game when she moved from Memphis to Denver in 2008, and she was hooked. She bought a Rockies cap; I got Mom a jersey with the No. 1 and her name on the back. She proudly wore both when she saw some games in person and the rest on TV. While we were in her room at Rose Medical Center, as she talked to the doctor and waited for surgery once more, my mother asked if the Rockies had won, and I shook my head. “Our boys try hard. You ought to be kinder to them,” she said. It was a demand, not a request. Mom always has been right, and all right. Billie and Woodrow were married as dirt-poor Tennessee teenagers during World War II, and brought one of the first Baby Boomers into being. My first memory is Mama and I taking the bus downtown to a department store. I was Gulliver in the land of Brobdingnag. “Hang onto my coat, and don’t let go,” she said. Of course, I let go to wipe my runny nose. I grabbed her coat, and trailed her through the store. A few minutes later I looked up, and that giant was not my mother. Of course, I cried (screamed) like a typical 3-year-old. My mother appeared, took me in her arms and made everything right. She took me for my first hamburger and Coke. Billie Paige, mother of Denver Post columnist Woody Paige. When I was 8, she coerced me into tap dancing lessons. I was the only boy in the class of a bunch of, ugh, girls. A year later, she sewed a clown outfit, created a blue Jack in the Box from a washing machine box and dragged me to march in the Cotton Carnival parade. At 10, while I was playing basketball in my first league game, she ran onto the court, ordered the referee to stop the action and demanded that I put my boxer shorts back on under my uniform. That Christmas, Mom and Dad bought me a portable typewriter and told me to fulfill my dream of becoming a writer. My dad was diagnosed with juvenile diabetes when he was 7 and fought the dastardly disease his entire life. My mom was right there for him, serving as his around-the-clock nurse until he died 40 years ago. She went out and got her first job — and worked at it until she was 65. I became an obituary writer for The Commercial Appeal in Memphis and dealt with death every day, but was commanded to use the words “long illness,” not “cancer” — a forbidden term. Nine years ago, my little sister died of cancer. I just couldn’t say or write the word. I persuaded Mom to come to Denver and watch over me. “Mama, I don’t know how I was able to drive before you got here. Thanks for your advice at every red light.” She told me I wasn’t funny. I told her she indeed was funny. The ESPN show I’ve appeared on for almost 13 years, “Around the Horn,” wanted Mom to be a celebrity selector in the NCAA basketball tournament bracket contest. She chose cats or dogs (nicknames) or her favorite colors in every game. She would tune in to see me every day on ESPN, except, she said, when Dr. Phil had a good show. I found out later she had collected every column I’ve written for the Rocky and The Post for 41 years. In 2012 doctors informed Mom she had a serious sickness — and she should transfer immediately to a hospice. My mother was having none of that. She prayed; she stayed strong; she underwent dozens of treatments and surgeries; and she worked that disease to a 3-2 count by mid-2015. Several days ago, as I took my mom home from the hospital, she asked me to get her a hamburger and a Coke. I told her to hang onto my coat, and not let go. She smiled. Perhaps, at last, she got my sense of humor or my understanding of our extraordinary history together. She finally struck out … swinging with all her might and faith. She was an incredible wife, mother, grandmother (Shannon Paige and Alex Sarver), friend, Southern Baptist and a gentle, genuine lady. Her granddaughter said: “Granny’s birthday was Pearl Harbor Day, and she died on the Fourth of July. She was a real American.” In lieu of flowers, she asked that donations be sent to the Children’s Diabetes Foundation and the American Cancer Society. The last line Mom penned in her journal was “Someone to watch over me” — a Gershwin song recorded in 1926, the year she was born. Bye, Billie. I love you. Someone powerful watches over her now, and Mom still watches over all of us.